Robert Clouston Young was a Glasgow painter in oils and watercolour. 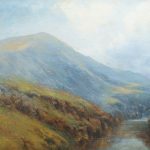 He was elected to the Royal Society Of Scottish painters in Watercolour in 1901. He often painted views of the Clyde and coastal scenes. 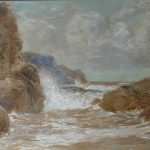 Clouston Young was well known for his `wet in wet` watercolour technique which gave rise to paintings of great subtlety and atmosphere. Later in life he lived in Ardrossan.